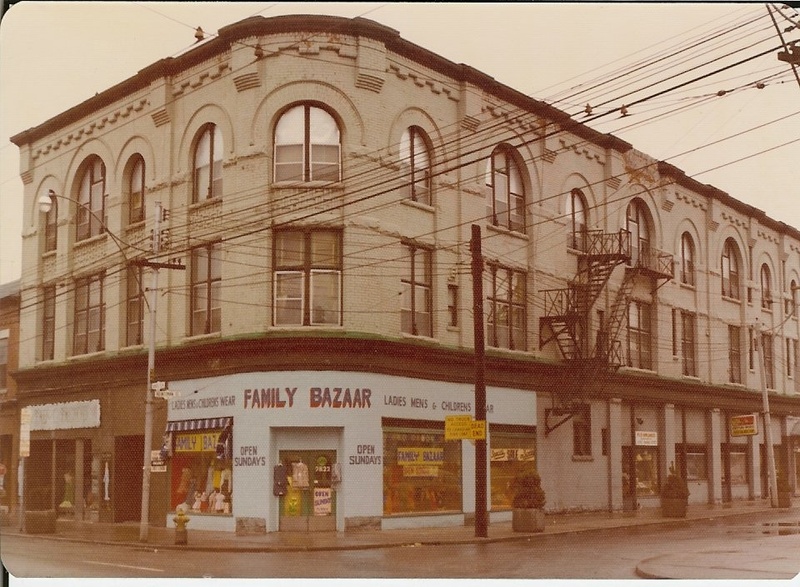 James Ellis designed a three-storey block at the northwest corner of Dundas and Van Horne (later Heintzman Street) in 1891 for Lucius Kilburn (1834-1913), a Quebec-born developer. Ellis relocated his own architectural offices there by the following year. The architect’s plan included “a place for entertainment that would have been a credit to any city,” recollected A.B. Rice in his Stray Thoughts on Matters of Public Concern column in 1949. “It had a large stage, two spacious dressing rooms and a sloping floor on which 800 people could sit on chairs.” Kilburn Hall was used for a variety of performances and community fund-raising events. 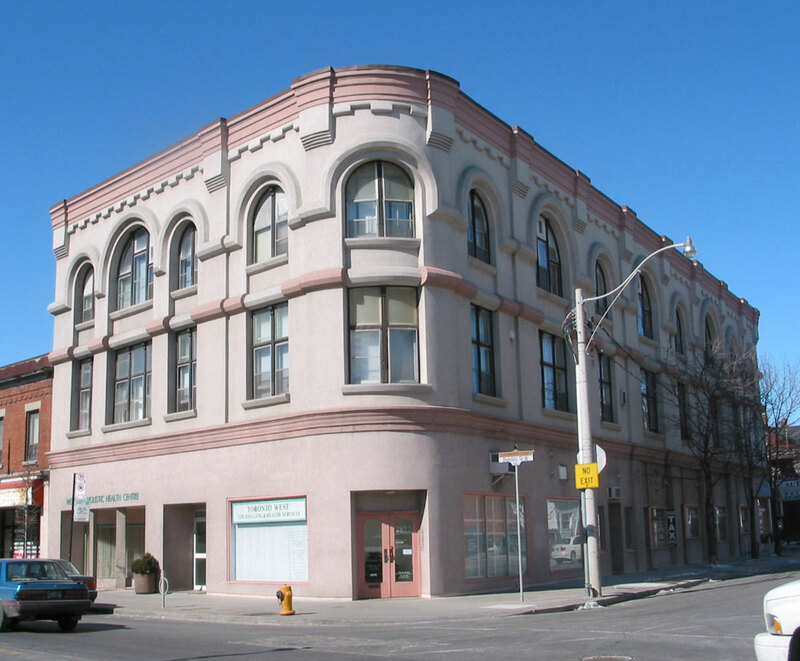 In 1894, the West Toronto Junction Mechanics’ Institute moved its library and reading room to the second floor of the Kilburn Block. In 1899, the Junction library operated out of two small rooms in the building, until A.B. Rice as chair of the Toronto Junction Public Library board secured a grant from the Carnegie foundation to build the Annette Street Library and commissioned Ellis to design the new building. Source: The Most Attractive Resort in Town, Public Library Service In West Toronto Junction (1888-2009) 2nd Revised and expanded edition, by Barbara Myrvold, Toronto Public Library, 2009. When West Toronto Junction voted for the ‘Local Option’ — banning the sale of alcohol for almost a hundred years — and closed the bars on April 30, 1904, Kilburn Hall hosted a minstrel show the next night, ushering in the theatre era in the Junction in which the hotels and taverns were replaced by a thriving theatre district. revival windows at the third floor give the facade a dignity befitting a major public building; the heavy stepped brick corbelling at the top of each of the pilasters (as well as two additional ones to create emphasis at the rounded corner) to emulate a column capital but abstract in form and material choice; the crenellated brick coursing just below the top of the roof parapet which alude to defensive fortifications lending an aura of strength to the building. Note that the strong, visually heavy line at the second floor level stresses the separation of the commercial ground floor from the more distinguished upper floors. This is quite common in mixed use buildings. The Dundas facade features a large two storey triple window composition which is repeated in a slightly stretched version for the rounded corner of the building. The Heintzman Street elevation features an alternate play of large and medium sized window compositions. The use of stone lintels for the second floor windows and stone sills for the third floor windows, as well as stone bases to the springing points of the brick arches also lends an air of dignity to the facade.